Leaving the quiet country roads of Llanboidy, my arrival at Cowshed Cymru was like falling through the proverbial rabbit hole. Already home to the wonderfully eccentric chocolate brand Nom Nom, Bronyscawen Farm now sits on the cusp of another transformation; this time in to a collaborative working space for creative and makers from Wales and beyond. Late July saw the official launch of Cowshed Cymru; an on site circus of candyfloss, cocktails, chocolate, and food prepared by Llys Meddyg. While the site was full and the car park overfilling, there was one couple who had made a particular effort, painted and dressed as complimentary clowns, and accompanied by their border collie Winston, who was accessorised with an oversized bow tie. While spaces for creatives is at the heart of Cowshed- one of the social enterprise’s objectives is to provide an opportunity for makers to stay and work in West Wales rather than be forced to leave the area- the architecture of the farm has possibilities for other start ups. Dark corridors now filled with spooky remnants of old factory tours, and rooms still lined with abandoned chocolate moulds has been signed over for an as yet undisclosed tourist attraction. Two spaces are asking to be picked up as a micro brewery and a delicatessen/farm shop respectively. On the edge of the property a large barn has been earmarked for a cinema and gaming area, whereas outdoor space looks set for camping, and Lee and Diana have plans for rudimentary dormitories complete with bunk beds, cooking facilities, and showers, so that members of the Cowshed family can stay when work and magic carries them late into the night. 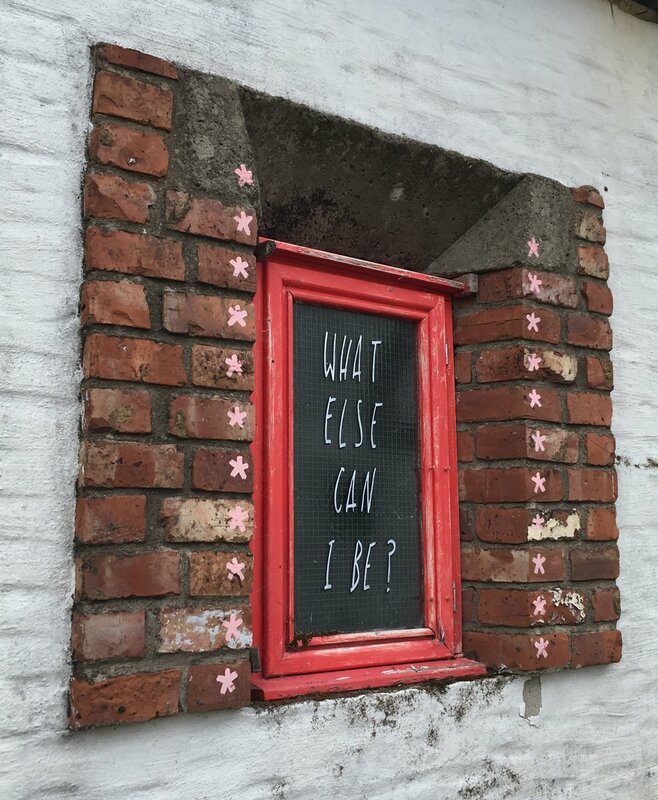 A giant outdoor kiln is already used by an itinerant ceramicist, while two loft spaces have been signed up by a photographer, art foundation students have set up their own common room, and Lee himself is installed in a studio adjacent to a room that will one day be a gallery. Even the obviously commercial- a gallery for displaying and one would assume, selling, art- is presented in the same spirit of collaboration and freedom. Those exhibiting will pay no commission or rent, but will be expected to curate and market their events themselves. The future of Cowshed Cymru lie in the hands of Lee John Phillips and Diana Brook. Diana is now teaching part time at Redhill School, but for twenty years was Head of Art at Sir Thomas Picton in Haverfordwest. Lee is an illustrator and former secondary school art teacher who has attracted a following for his work drawing and recording every item found in his late grandfather’s shed. The Shed Project, which will chronicle around 100,000 pieces taken from the shed, has previously been described in the national press, and is ongoing. Alongside this Lee is now project manager at Cowshed Cymru, and is determined to make The Abandoned Chocolate Factory (as Bronyscawen is now known) into a creative and supportive space for other makers. The nooks and crannies of the abandoned factory, and the potential open spaces of the old farm buildings, will provide working environments suited to all temperaments; from cubicle space for quieter work, to larger rooms for those needing to thrash out ideas and create physically bigger projects. On arrival potential community members can choose their own work area; the only caveat being that they must clear the space themselves, furnishing it with their own pieces or with items salvaged from the still crammed outbuildings. For the launch party Lee encouraged attendees to tag their social media uploads with #socialistcreativeutopia and that indeed is the lasting impression of the event and of his forward vision. Whereas many would be tempted to monetise the potential of the abandoned chocolate factory and capitalise on the interest in collaborative work spaces, the people behind Cowshed stay true to their core values of providing opportunities for people to pursue their imagination, without some of the usual impediments to working in the creative industries. Despite the current clutter and dust of some of the rooms, and the dolls and debris of the old chocolate factory still looming from shelves and bearing down on the darkest and narrowest of corridors, it is not difficult to be sucked in to the whirlwind of imagination, curiosity, and compassion, that defines Cowshed Cymru. Signs and graffiti pointed at potential workspaces and their potential use, and the air buzzed with attendees remembering their own abandoned creative dreams, and seeing now an option to relight fires from the smouldering ash. There is no doubt in my mind that now that the circus has left the factory, the hard work will continue, the magic will be cast, and alongside the existing wonder of Nom Nom a raft of other creative endeavours will rise at The Abandoned Chocolate Factory. For now, watch this space, and if anyone wants to clear a barn, Cowshed Cymru may have a job for you. Anna Bowen is a freelance writer, agricultural consultant, private tutor, and occasional model based in West Wales. She writes about rural life on www.askauntannie.com.